A year-and-a-half and over $20 million later, the Mueller investigation is finally nearing its end. At least, one would hope. Special counsel Robert Mueller is reportedly “close to issuing findings” into alleged collusion between President Trump and Russia, the goal being right after Election Day — a sharp contrast from former FBI Director James Comey’s attempt to tip the scales in favor of the Clintons in 2016. To date, the Mueller investigation has failed to produce a single shred of evidence Trump conspired — or even attempted to conspire — with the Kremlin to win the White House. Instead, the investigation has veered off-track, delving into Trump’s personal life and Trump campaign officials’ long-ago misdeeds before working for the president (see: Paul Manafort). Nonetheless, anti-Trump Democrats have made a fetish of the word “collusion” and continue to tickle their fancy on Capitol Hill and campaign trails nationwide. Democratic Sen. Ron Wyden of Oregon recently criticized Donald Trump Jr.’s meeting with Natalia Veselnitskaya — a Russian lawyer linked to the Kremlin — more than two years ago. Wyden breathlessly claimed the Trump Tower meeting showed “an intent to collude” — not “collusion,” you see, but apparently a more venial sin whose punishment should be Trump’s impeachment. Democratic Senate candidate Beto O’Rourke recently vowed to begin the impeachment process, claiming “there is enough there” to make the collusion case. He then failed to identify the “there” there, providing no evidence to back up his bravado. 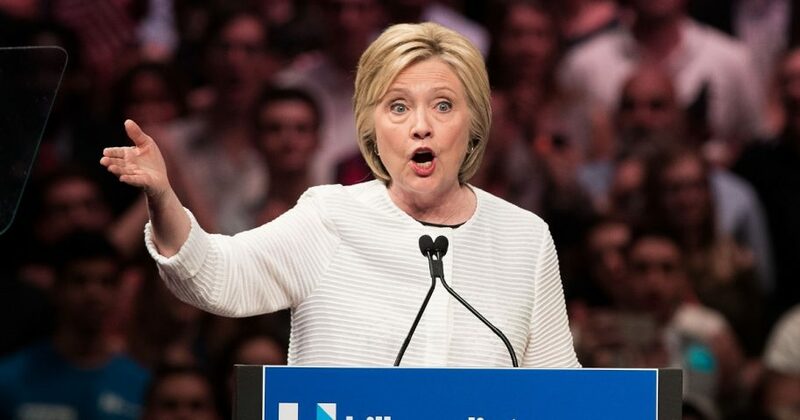 The faux outrage simply masks their own guilt regarding the well-documented collusion by Hillary Clinton — collusion much more based in reality, and touching the highest echelons of the Democratic machine. In 2016, the Clinton campaign, Democratic National Committee, their law firm Perkins Coie, and Christopher Steele — the ex-British intelligence officer who authored the infamous “pee dossier” — violated campaign finance laws to manipulate the outcome of the presidential election. As the Coolidge Reagan Foundation explained in a recent complaint with the Federal Election Commission, Clinton and DNC officials hid sizable payments made to and received by Fusion GPS, the research firm that hired Steele to produce the dossier. Moreover, they colluded with anonymous former and current Russian officials — in concert with Steele — to promote research findings solely designed to influence the 2016 election. As the Coolidge Reagan Foundation’s complaint details at length, the Clinton campaign hired Perkins Coie lawyer Marc Elias for the 2016 presidential election cycle. Elias then hired Fusion GPS to conduct opposition research on Trump. Clinton’s campaign and the DNC then funneled more than $1 million through Perkins Coie to Fusion GPS, which enlisted Steele and other Kremlin-linked “researchers” to produce the dossier. Clinton’s campaign manager Robby Mook personally approved the payment to Perkins Coie, establishing a money trail between the highest levels of the Clinton campaign and Russian interests. This money trail — which the parties involved sought to conceal at all costs — is exponentially more substantiated than any “collusion” allegation levied against Trump, and yet Democrats scramble out of their way to ignore it. Do you think Hillary Clinton will ever be held accountable? Anti-Trump Democrats allege Trump may have received useful information from the Russians. Hillary Clinton paid hundreds of thousands for it. They allege “collusion” because one lawyer with “Kremlin ties” was involved. Hillary Clinton paid for Russian intel. Democrats would punish the flirt, but protect the cheater. We had Clinton cash. Now we have Clinton collusion — documented collusion. The rest is just hot air. Dan Backer is the founding attorney of political.law, a campaign finance and political law firm in Alexandria, Virginia. He is also the founder and president of the Coolidge Reagan Foundation, a nonprofit organization dedicated to the principles of free speech enshrined in the Constitution.